This flexible series is nearly identical to the TF-6070 Series foams, with the addition of offering flame retardation. These durable, long-lasting foams are formulated to absorb significant energy while protecting payloads. These products offer excellent creep resistance under high static stress, and are available as polyurethane foam sheets and blocks. The TF-5070 series has been used as a “spring-damper” for submarine launch tubes. 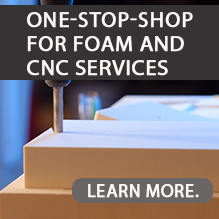 In the construction industry, these flexible urethane foams serve as shock isolation. Other applications include serving as an impact-mitigation pad for shipping containers, and vibration-damper pads for mechanical equipment. These products are available as sheets, blocks and molded parts. Shown are maximum standard stock sizes based on density. Cut sizes are available from .25 inches (6.35 mm) (depending on density), up to standard stock heights as listed above.